Oh I love this weather! Warm weather is the best way to get out of a running rut. I have to admit that it is taking me a little longer this spring to get back on the running bandwagon. After my marathon last October I took it pretty easy, averaging only one run per week all winter. I had a million excuses this spring but FINALLY this summer am starteingto get excited about running again. The chance to run in races for free! Okay, this is a shameless plug to get you to enter the giveaway on my blog but who wouldn’t want the chance to win free race entries to the IMT DMM race of their choice OR free $100 Altra Running gift cards! Check out the Rafflecopter on my blog for MANY, MANY, MANY ways to enter. And don’t forget to enter daily. Hurry, the giveaway ends Monday, May 28th at midnight! Being healthy again. I have to admit that I gained a few pounds over the winter, which came from a combination of unhealthy eating and lack of excercise. Getting back on track (pun intended) has helped me make healthier food choices this past month (and lose the 5 pounds I gained!). Positive Attitude. Such a great way to get outside and just think about things. 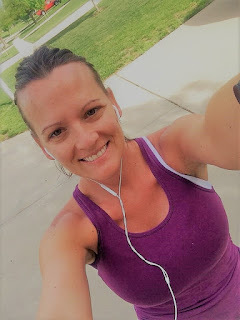 I am home with my kids in the summers and let me tell you that my morning run is often the most relaxing part of my day! It helps me start my day off in a positive, motivating and very quiet way. The sun! I love getting that runners tan! Taking my three kids to the neighorhood pool isn’t a very relaxing experience for me, as one kid is sure to dunk another, who pushes the other in, who steals the sqiurt gun and sprays me, who throws the Goldfish crackers in the pool to see if they really can swim… I think you get my point. It isn’t all about laying out and relaxing. My run DOES give me some good sun time that I actually ENJOY. Remembering why I started running years ago. 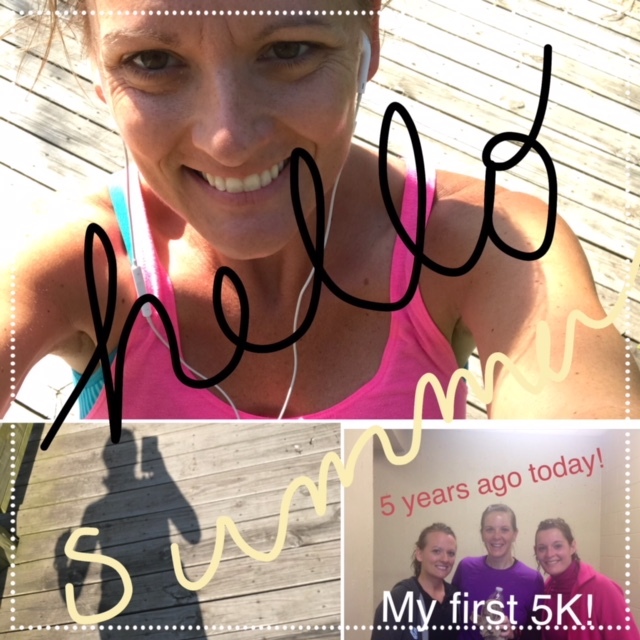 I included a picture in this post that came across my Facebook “On This Day” feature today and it, ironically, was of the day I completed my VERY FIRST 5K! I remember how proud of myself I was. Seeing that picture this morning really did make me want to get out there and hit the trails. It also made me miss a few friends I haven’t seen in awhile. Running with friends is also one of my favorite things about running, but I’m trying to keep this list at just five. What do you love about running? Do you agree with my favs? Do you have your own? Comment below- I’d love to see what you have to say. And don’t forget to enter the giveaway- you could win one of 4 free race entries or one of two $100 Altra Running e-giftcards! *cross posted on the Des Moines Marathon blog.